Copyright 2007, Heather L. Whitehead. Used with permission. CSA Materials Research Database with METADEX comprises a group of 10 databases: Aluminium Industry Abstracts, Ceramic Abstracts/World Ceramics Abstracts, Copper Data Center, Corrosion Abstracts, Engineered Materials Abstracts (consisting of Ceramics, Composites and Polymers subfiles), Materials Business File, METADEX, and WELDASEARCH. On the broadest level of the hierarchy, CSA Materials Research Database with METADEX is part of the CSA Technology Research Database (Sapp 2005). CSA, formerly Cambridge Scientific Abstracts, is a worldwide database aggregator with traditional strength areas in the natural sciences and technology. CSA customers include more than 4,000 libraries and institutions worldwide. The company, officially ProQuest/CSA, is now owned by privately-held Cambridge Information Group (Ojala 2007). CSA Materials Research Database with METADEX covers publications related to materials science, metals, alloys, ceramics, polymers, and engineering composites. Topics covered include raw materials, processing, refining, end uses, performance, and recycling, as well as business aspects of materials science. 2,915,309 records were included as of March 2007. Databases begin in the 1960s, 1970s or 1980s; select older references are included. Updates are monthly, with about 100,000-125,000 records added annually. Records are bibliographic, including indexing and abstracts (if available), but not full text online. Within the group, METADEX has the largest number of records, about 50% of the overall total. Copper Data Center has the smallest number of records, 71,164 in March 2007. Many of the databases in the group continue long-standing print equivalents (e.g., Metals Abstracts is now part of METADEX). Databases are either produced by CSA or hosted by CSA on behalf of industry partners such as CERAM Research and WELDASEARCH in the UK, and the Copper Development Association in New York. Sources covered include 3,469 periodicals, conference proceedings, technical reports, trade publications, patents, books, and press releases. Within METADEX, about 15% of the covered sources are designated "core" and are indexed cover to cover; the remaining 85% are designated "priority" (over 50% indexed) or "selective" (less than 50% indexed). A journal may be "core" within one database in the group, but "selective" in other databases. The Serial Source List is available to browse or download. 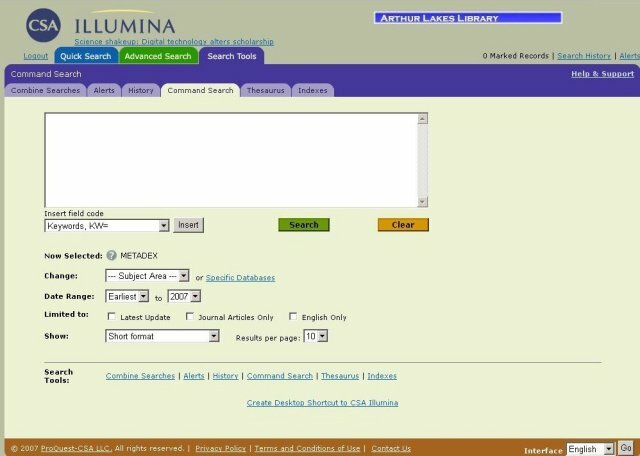 The CSA Illumina search interface displays the currently selected database(s), with an option to change to other databases; a "?" icon links to more database information. Date range (all available years or selected lesser intervals) and interface language (English, French, Spanish, and others) may be selected at the search entry level. "Search tips" links to full search help. Quick Search is clean, simple, and functional. Brief examples indicate the wildcard, "*", and that exact phrase searching is the default. Many searchers expect this type of interface to produce ranked keyword AND-type results, and will miss useful search results by not realizing or understanding the phrase search constraint. CSA could make this clearer, perhaps adding "keyword AND keyword" to the brief examples. Advanced Search allows more complex and focused searching by using dropdown fields and the obvious use of AND and OR; additional query lines can be added if needed. Both Quick Search and Advanced Search support proximity searches and relative word order searches (NEAR, WITHIN X, BEFORE, AFTER). Command Search (Figure 1), under the Search Tools tab, allows command-line searching with Boolean operators, field codes, wildcards, and proximity searches. This interface is useful to those with experience in creating structured search strings; the average user will not take advantage of it, and its location as a Search Tool is appropriate. 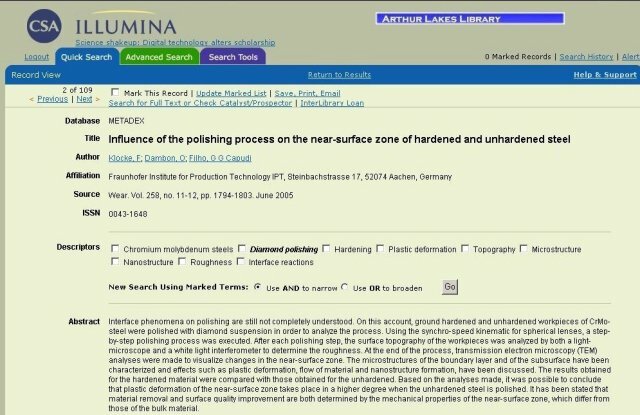 Recent patent literature is critical in materials science fields. CSA supports this research need by adding search results from the MicroPatent Materials Patents database to search results from CSA Materials Research Database with METADEX or any of its component files. US, European, and Patent Cooperation Treaty patents from 1996 are included, with monthly updates. Indexes of terms used in a specific field of a database are linked under Search Tools. Each database has its own unique author name index. Most databases have a publication type index, and a few have a journal name index, including at least some abbreviated journal titles. Index terms can be selected and searched. Thesauri allow users to browse for terms via a hierarchical, alphabetical, or rotated index display. Appropriate terms can be selected and searched. CSA Materials Research Database with METADEX thesauri include a Master authority file of 40,000 controlled vocabulary terms, a Copper Thesaurus, and Special Thesaurus for METADEX in English; Spanish and French versions are in Beta testing. Available thesauri for a given database are displayed in a drop down box. Summary search results are sorted by Most Recent first, with the option to change to Relevance Rank. Results are categorized by source type (e.g., peer-reviewed journals, books, web sites) and users can toggle back and forth among the categories. The summary search results screen includes facets based on Descriptors in each record; clicking on a Descriptor facet launches a new search. In the detailed record display (Figure 2), facets can be selected and used to narrow or broaden a search. Search results include bibliographic information, author affiliation and e-mail, abstract, classification codes, descriptors, and article references. A maximum of 500 records at a time can be marked for output. Output options are many: save as PC, Mac, or UNIX, print, e-mail, or create a bibliography using QuickBib citation manager, which formats references according to eight popular bibliographic styles. Users also have the choice of predetermined short or full formats, or can customize the fields they prefer. Search History retains the most recent 50 searches from a session. Searches can be combined, re-executed, and saved as Alerts. Alerts, which require Personal Profile registration, run automatically every week and deliver up to 250 new matches to the e-mail address specified in the Personal Profile. The Illumina interface can be set up to show an institution's logo or banner. The default search interface and language, the number of records displayed, and other parameters are also customizable. Referral links can be set up to access full text via OpenURL, E-resource management systems, ILL forms, etc. Available usage statistics include signons and searches by database by month. Because CSA offers unlimited connections to its databases, turnaways are not a factor. CSA should rethink the default phrase search in the Quick Search interface; phrase searching is part of Advanced Search, and the more sophisticated searcher can find and use it there. The text that indicates the database(s) "Now Selected" could be made more prominent. The ability to select facets and include/exclude them to refine a search from the summary results display, as well as from the detail results display, would be a useful addition; this feature adds value to the Engineering Village interface (Dess 2007). CSA Materials Research Database with METADEX has no real competitors. Some of the sources are also covered by Compendex, but many are not. It is possible to subscribe to selected titles within the group, but CSA discounts for multiple database purchases make the group purchase attractive. For a library supporting significant research in materials and metallurgy, the database group is essential. Dess, Howard M. 2007. Inspec via Engineering Village (EV). Issues in Science and Technology Librarianship Winter 2007 (49). [Online]. Available: http://www.istl.org/07-winter/electronic1.html [Accessed: April 23, 2007]. Ojala, Marydee. 2007. Cambridge Information Group buys ProQuest information and learning: an interview with CEO Martin Kahn and President Matt Dunie. Online 31 (2): p. 21-24. Sapp, Megan. 2005. Technology Research Database of Cambridge Scientific Abstracts (CSA). Issues in Science and Technology Librarianship Spring 2005 (42). [Online]. Available: http://www.istl.org/05-spring/databases1.html [Accessed: April 23, 2007].